The big idea in the book is to think of your work with the lens of a master craftsman. Job Burnout is a special type of job stress – a state of physical, emotional or mental exhaustion combined with doubts about your competence and the value of your work. 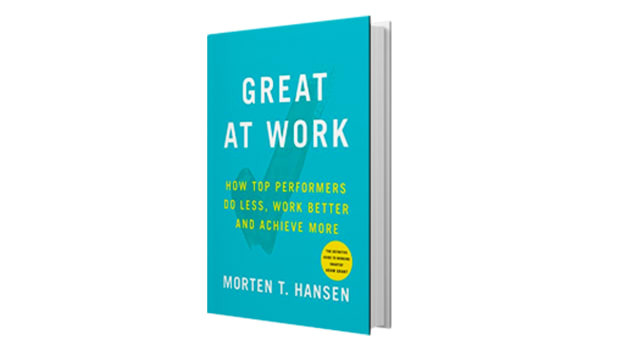 If that definition resonated with you, then this is a Morten Hansen has written this book for you. There are seven principles outlined in the book. Four of them are for improving your own impact. That is what I found useful. This is beyond the usual, “Work smarter, not harder” cliché. His first advice is to “work less, then obsess”. Some leaders build a daily “Not-To-Do” list along with the to-do for the day where they write no more than 2-3 outcomes they want for the day. This is really the equivalent of bringing mindfulness to the work that you do. Besides spreading yourself too thin, when you take on too many priorities, you exponentially increase the complexity in your life. There are more meetings to attend, more people to collaborate with and less time to build the relationships at work that allow you to be more effective. “As few as you can, as many as you must” would be a good way to decide. Every craftsman continues to polish and chisel in order to produce a masterpiece. The film, Jiro Dreams of Sushi follows Jiro the 90-year-old Jiro Ono – the sushi chef who runs a Michelin three-star restaurant in Tokyo, called Jiro, which serves top-quality sushi – and only top-quality sushi – starting at 30,000 yen (approx. Rs 19,000) for a 20-piece tasting course. For every day since the Second World War, Jiro has done exactly this. He obsesses about perfection. His apprentices must spend 10 years learning to use their knives before they're allowed to cook even eggs. Alfred Hitchcock, the master of suspense and horror had shot the famous shower sequence in the film “Psycho” seventy times before he felt he had got it just right. That is the magic of perfection. The way to do this is to redesign your work so as to focus on value, not goals. Looking at your work in terms of the impact you are creating for others helps you discover your passion and purpose. Spending just 15 minutes a day of “deliberate practice”. While regular practice might include mindless repetitions, deliberate practice requires focused attention and is conducted with the specific goal of improving performance – like Jiro crafting each piece of sushi. The big idea in the book is to think of your work with the lens of a master craftsman. As a gig worker, I can certainly implement many of the seven ideas in the book. For someone who is employed in an organization where being seen to be busy is the desired behavior, working with a craftsman’s lens may not be feasible. Unless the organization changes the way they evaluate performance, such an approach may not be viable. Overall recommendation: Worth a read. Especially to understand how you can focus on creating impact through value, not just a long to-do list.